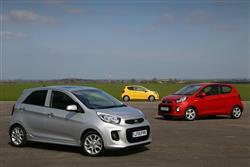 Find out everything you need to know on the new Kia Picanto from independent vehicle review website Car And Driving. You can watch the video review to the left to see more of the car or read their written review below to get a true insight from an expert in the automotive industry. Pricing for an early 1.0-litre MK2 model Picanto in base '1' trim starts at around £3,000, with values for this particular variant rising to around £7,600 for a later model from early '17. Most buyers will want the five-door rather than the three-door bodystyle (the five-door commands an extra £100 premium). Get this bodyshape and for an extra £50 premium, you can get yourself a Picanto 1.0 with air conditioned '1 Air' trim. If you want a little more equipment, there's a '2'-spec model, which demands a premium of around £1,200 over the base-spec variant. Or an 'SR7'-spec derivative, where the premium over base trim is reduced to around £800. The alternative engine for Picanto buyers is a 1.25-litre petrol unit. For an early '11-era one of these in base '2'-spec trim, you're looking at around £3,750, with values rising to around £8,200 for a later '16-era car. If you want plusher '3'-spec trim, the premium is around £250.